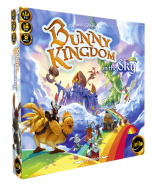 Secretly rally rabbit lords and recruit skillful masters to make your cities and resources even more valuable at the end of the game. After each turn, your groups of contiguous warrens grant you points depending on the cities and different resources they include. The game ends after 4 turns, and the player with the most points wins the game.